- "You're a good friend, Sarah"
- "I have done all I can to pass on who I am..."
- "She has done something immortals can do..."
Susan might be able to fill in some of the blanks, but it's Elliot, Ellen and Ashley who have the bigger inside scoop on why it all happened. Part of me was hoping to have a different scene here today to put off THE FEELS for myself, but I looked at it from every angle, and nah. This needed to be next. 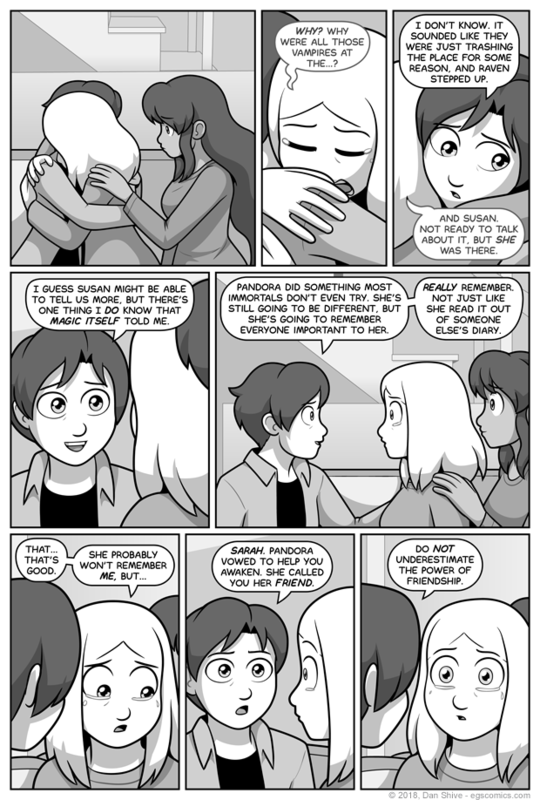 Grace didn't technically have anything to say on this page, but you KNOW she had to be there for this talk. There was no way she was going to be like "right, have fun telling Sarah about what happened to Box / Pandora. I'm going to go somewhere else for a bit." Speaking of Grace, here's the deal with the waviness of her hair: I've decided it's naturally wavy in full human form, but is naturally straighter when half-squirrel. As for why this has only been the case recently and not during the full history of the comic, I'm gonna say... Magic. Or, you know, evolving art style, or maybe Grace just decided she likes it that way, or any number of explanations that will never actually come up in the comic and are therefore equally valid. If anyone asks, though, I'm just going to say "magic" in as snarky a way as humanly possible.